The Chad Valley Designafriend Sara Doll certainly marches to the beat of her own drum. 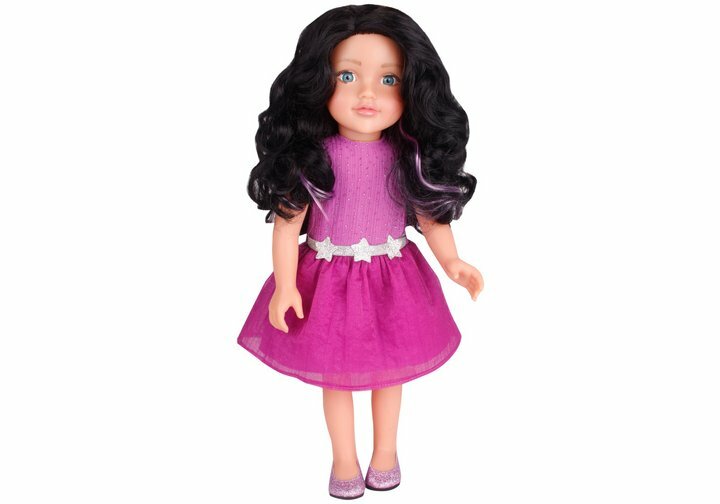 She likes her hair colour to match her dress, so today she's rocking purple highlights to match her lovely purple dress, which is eye catching itself with a silver glitter star waistband. Naturally to complete the ensemble Sara has glitter purple shoes, they need to match the hair after all! Beautifully packaged in Designafriend box wrapped in tissue paper. Chad Valley Designafriend Sara Doll comes carefully gift packaged in a boutique style box with soft tissue paper and contains a unique charm that can be easily attached to the Designafriend doll charm bracelet. Size H47cm. Get money off with April 2019 free Argos voucher codes, see if there's a promo code for the Chad Valley Designafriend Sara Doll product. Argos may be out of stock of this product. To enhance your shopping experience you may also be redirected to a search results page when you click an outbound link.